The BJP today accused the Election Commission (EC) of disregarding the primacy of the constitutional mandate of Article 174 which disallows a gap of more than six months between two Assembly sessions and asked the EC to “realise the consequences of the situation created by it”. Should Petroleum Minister Ram Naik quit because of the petrol pump allotment scam? Putting on a brave face after the Election Commission ruled out an early poll in Gujarat, Deputy Prime Minister L.K. 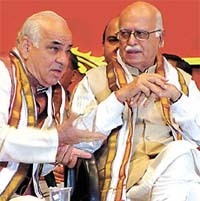 Advani today claimed that the BJP would win hands down whenever elections were held in the state. In a bid to carry forward the peace initiative launched by former Law Minister Ram Jethmalani, Jammu and Kashmir Chief Minister Farooq Abdullah today assured Prime Minister Atal Behari Vajpayee that he was willing to step down in case the Hurriyat Conference agreed to take part in the ensuing poll. Jammu and Kashmir Congress chief Ghulam Nabi Azad today said that the party would have no alliance in the forthcoming Assembly elections in Jammu and Kashmir. EDIT: Is autonomy a panacea for Kashmir’s problems? Watch out, they could be your kids too! The Delhi Police today arrested Satya Prakash, third key accused in the journalist Shivani Bhatnagar murder case. Joint Commissioner of Police (Crime) U. K. Katna said Prakash was arrested around 1.30 p.m. from Faridabad. In video: Daughters of Ravi Kant Sharma defend their father. Union Finance Minister Jaswant Singh today said that the government was committed to initiate reforms in both direct and indirect taxes, taking away the discretionary powers of the bureaucracy. In a major diplomatic and political breakthrough in the IC-814 hijacking case, the USA has agreed to interrogate, on behalf of India, the arrested Foreign Minister of Afghanistan’s deposed Taliban regime, Vakil Ahmad Muttavakil. Top sources in the government here told The Tribune that a detailed questionnaire had been sent to Washington for the purpose. The Punjab Chief Minister, Capt Amarinder Singh, today affirmed that the International Financial Consortium has in principle approved a financial involvement of US $ 1 billion in the state. The Punjab Chief Minister, during his recent visit to the USA, had made a presentation to the IFC for three projects involving an investment of US $ 1.2 billion. The price of agricultural land has crashed in Malwa due to drought. Farmers say the prices have fallen between 15 and 20 per cent per acre. The prices may fall further if the dry spell continues. In normal times, an acre irrigated by canal water or tubewell used to fetch a price between Rs 2.25 lakh and 2.50 lakh. However, now the price is less than Rs 2 lakh . The per acre rent of a good fertile piece of land is between Rs 10,000 and Rs 13,000. Copyright : The Tribune Trust, 2002.